On National Women in Engineering Day 2016 we ask Professor Jane Rickson, Chair of Soil Erosion and Conservation and President Elect for the Institution of Agricultural Engineering, and Dr Helen Lockett, Senior Lecturer in Computer Integrated Design, about working in engineering. What’s the best thing about working in science, technology, engineering and maths (STEM)? JR: I see STEM as trans- and multi-disciplinary, so it can help address many of the world’s toughest challenges. In my job, scientific understanding is used to develop technologies to solve these issues, including how to produce enough food and energy to meet increasing global demands; how to reverse the loss of natural ecosystems; and how to cope with climate change and extreme weather events. It follows that many solutions need engineering approaches. Also, working in STEM is a great way to stay in touch with fellow professionals, as well as making new contacts in the industry. Through the Institution of Agricultural Engineering, I have gained Chartered Environmentalist status, which has helped in developing my career. HL: I enjoy working with students to help them to develop their engineering knowledge and skills. In my research work I enjoy coming up with new ideas and seeing them through to implementation. What was it that most appealed to you and how did you get in to the job you’re in now? JR: I am fascinated by how scientific principles can be applied in practice to develop technologies to solve important problems. For example, we have to understand the fundamental chemistry, biology and physics of soil degradation processes (e.g. soil erosion) at the particle scale to predict when and where the problem might be significant. We can also use mathematical models to test whether our predictions are sound. The scientific understanding of processes helps us design technological interventions such as erosion control blankets and soil conditioners to control the processes of erosion. HL: I enjoyed maths and physics at school but didn’t want to study a pure science. I always enjoyed making things and made an electric bass guitar when I was still at school. All of the practical design and make knowledge I gained in my early life helped me to develop my current research work in aircraft design for manufacture. JR: I have a first degree from Kings College, University of London, where I specialised in geomorphology – the study of landscape forms and processes. I then took a Masters degree in Agricultural Engineering at Silsoe College, focussing on land resource management. My Master’s thesis was on soil erosion and I have stayed in that subject area ever since. I started my teaching career as a Teaching Assistant at Silsoe College, and became a Lecturer in 1986, followed by Senior Lecturer and then Professor in 2007. How did your beliefs, motivations and aspirations about your career change as you grew up? HL: Initially I wanted to be a sound engineer and studied electronic engineering, but I later realised that I was more interested in mechanical design and manufacturing. I was lucky enough to achieve a job as a Teaching Fellow in the College of Aeronautics that allowed me to pursue a career as an academic in engineering. Did you have any particular influencers that encouraged you? Or anyone who was a barrier to your progress? JR: My first influencers were my school teachers, who encouraged my enthusiasm towards protecting and improving our natural resources. Since then I have always been fortunate to work with inspiring scientists and engineers. HL: As a young woman in engineering I definitely found it difficult to be taken seriously, both by staff and students. But I was lucky enough to have some supportive managers who encouraged me to pursue my goals. Have you faced any challenges as a woman working in STEM? If so, what were they and how have you faced them? JR: On balance, I would argue I have had no more challenges than men in a similar role. What social, cultural, economic, and emotional undercurrents do you think are at play when it comes to encouraging girls and women into STEM subjects? JR: I think there is still some gender stereotyping of subjects at school, but this is improving over time. HL: I believe that there are many complex reasons why young women do not choose careers in STEM. In order to change the social environment we need to change the perceptions of STEM subjects from a very early age (i.e. pre-school and primary school). One weakness in the current education system is that STEM teaching in schools is still based around the pure science subjects and the link between STEM subjects and creative roles in engineering design is not made clear to children. What do you do on a typical day (if there is such a thing)? JR: I have been at Cranfield for 30 years now, and no two days are the same! My job is a mixture of research, training/teaching and consultancy. My research looks at fundamental and applied soil science at a range of spatial and temporal scales. It has focused on the assessment, monitoring and management of soil resources to aid better understanding of soil functions and their role in agricultural production systems. I am interested in the concept of soil quality and soil health, and how these are linked to the delivery of vital and ecosystem goods and services, such as food production, water regulation and climate change mitigation through carbon storage. My research also addresses the effects of soil degradation on soil quality, and how technology can be used to solve these problems. I work closely with the agricultural industry, including farmers, growers, land owners, food processors, land-based charities, retailers and consumers. HL: Today I will be teaching Computer Aided Design to some of our part-time MSc students on the Aircraft Engineering MSc. I will also be providing one-to-one support for some of our full time MSc student research projects, checking on their research progress and reviewing their design work. At Cranfield’s recent National Manufacturing Debate one of the speakers suggested that more should be done to attract mid-career changers from industries that are making redundancies into engineering and manufacturing – do you agree? How might we go about doing that? JR: Ensure our recruitment processes are open and advertised to a wide audience. I think we would welcome suitable applicants to all posts. Some lateral thinking from complementary walks of life would be creative. At the same event it was suggested that until STEM industries improve their approach to flexible working, women won’t look favourably upon those kind of jobs. What’s your experience of that? JR: It is vital that employers take a flexible approach, especially with working parents (men and women). An explicit commitment to flexible working would make an employer more attractive to prospective employees. It would also help retain employees in the longer term and improve their motivation and job satisfaction. I was very fortunate that Cranfield is supportive to me with my family commitments. One suggestion is that policymakers, educators and the industry should make better connections between STEM and broader social impact. Do you think that would make a difference to the career aspirations of girls and women? JR: I think this is important, regardless of gender! Yes, knowing your work has impact can be a great motivator. This is recognised by Research Councils for example, who require all proposals to have a ‘Pathways to Impact’ section in the research application. It’s always good to think how your research will affect society as a whole. HL: I think that could help at some level, but I personally feel that it is more important to improve the connections between STEM and design. Engineering is all about coming up with new ideas and testing those ideas, but often young people are not aware of the role of creativity in engineering careers. Professor Jane Rickson is involved in research for Government and private sector clients e.g. soil degradation and loss of ecosystem goods and services; Soil Quality Indicators - physical properties; and the total costs of soil degradation. She is also involved in the training and teaching on Masters courses in Land Reclamation and Restoration, Environmental Engineering, and Soil Management, as well as bespoke short courses on soil erosion and conservation. 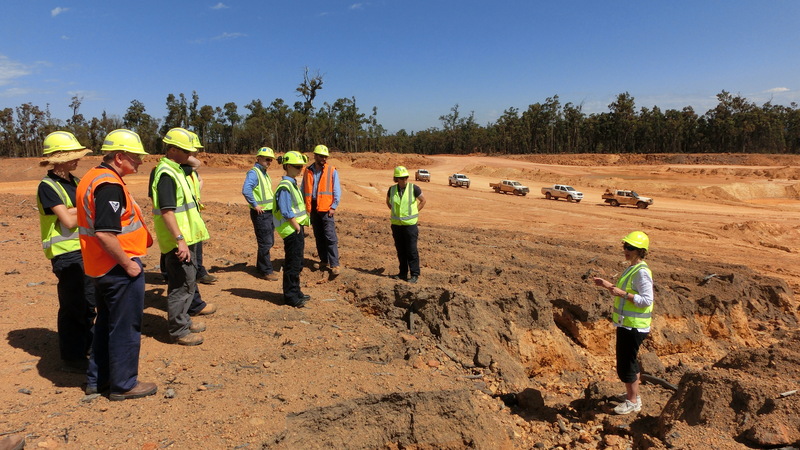 Consultancy activities include soil erosion and remediation in mine site rehabilitation. Dr Helen Lockett undertakes research in aircraft design for assembly and manufacture with a particular interest in designing for Additive Manufacture. She is a Co-Investigator on two current ATI/ Airbus funded research projects and has previously contributed to four EPSRC/ IMRC research projects and two European Union funded research projects. Helen has also undertaken industry funded projects in Computer Aided Design, Design for Manufacture and Through Life Support.